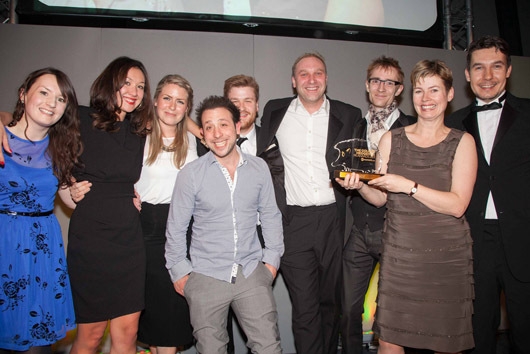 Stunning work from the whole H&G team at the PR Moment (or Golden Hedgehog) Awards on Thursday last week as a number of us took to the stage to be named the “Best New Agency”. It’s a cracking testament to the lovely team at H&G, which has grown to number thirteen since we launched in December 2011 – growing at a rate of almost one every month since we opened our doors. They’ve done some top work along the way for brands that include Honda, Bupa, O2, the Post Office, Meantime Brewing, D&AD, Berry Bros. & Rudd, UKTV, blinkbox, Clever Clogs, OrSaveIt, Blurb, School of Comedy … and a host of others – all people who have supported us along the way. So we really wanted to take a brief moment to say thank you to everyone else out there who has helped us along – recruiters, suppliers, clients, collaborators, supporters and cheerleaders (alongside friends and family for that matter).